Instead of drinking and eating during happy hours or business meetings, propose a workout class! Family. Friends. Dating. Work. The list of what women have to squeeze into 24 hours is ever-growing. Trying to fit in a workout and maintaining a healthy lifestyle often seems impossible. Those early-morning hours are used for precious sleep, while the time after work is used for essential schmoozing. Happy hour and boozy dinners have become key in the business world to stay one step ahead in competitive markets. With this process such an integral element of future success, many women have discovered a way to incorporate work into a workout: Invite clients and colleagues to a fitness class! Any type of relationship boils down to effective communication. Without a flow of dialogue, conversations become stale, and bonds can break down. Sustaining this discourse in the work force is dependent on shared interests and diversity in discussion. 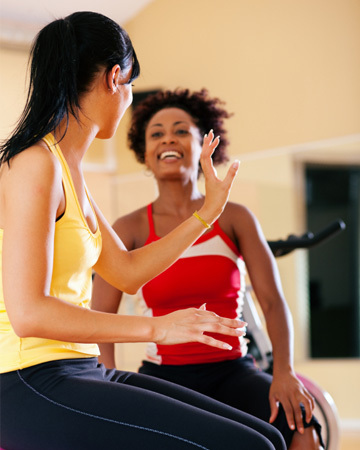 “Working out with a client is just another way of deepening your bond. If you have a shared interest in an activity, then you have more to talk about and connect on,” says Batista. Numbers, numbers, numbers: Clients want to see measurable results, and you want to see less on the scale. Beyond the added benefits of building unique and stronger relationships with your business contact, the simple math of choosing cardio over cocktails is undisputable. Just two drinks can add up to between 200 and 650 calories, so it’s easy for them to add up to 3,500 calories, or one pound gained.